New Releases and Coming Soon! I absolutely found this book to be adorable. It was a quick, fun, and delightful read. In the beginning of the book you have the Greek Gods Dionysus and Eryx bickering to each other that the god of wine “Dionysus” spends too much time gallivanting around with his booze and ladies, while the god of love “Eryx” wastes his time posing as mortals in the human realm pretending to be either a museum curator, professor, writer, or archaeologist. He just wants to ensure that the humans are doing the Greek Gods justice by making sure they have all their facts straight about their “myths” and handle their treasures properly. – Reading the first chapter alone I knew that I loved Ms. Leo’s humor and that this was going to be an entertaining read. This time Eryx decides to take on the role of becoming the new director of The Toronto Museum. He thought that since it’s in the middle of renovations and that they have a nice sized inventory of Greek valuables, they could use his help. I fell in love with him very easily from the descriptive words the author uses to describe him (swooooon) and his charming personality/attitude. The things he says to Maia will make your heart flutter a lot! Maia Douglas is a funny, witty, quirky, dorky, awkward and beautiful girl who is a curator at the Toronto Museum. Her father Dr. Jim Douglas is a famous archaeologist who’d founded most of the Greek collection housed in this museum so this is basically Maia’s second home. Word is getting around that the new Director Eric Lord will be arriving soon and that he is pretty ruthless when it comes to “cleaning house”. It’s no secret that she’s very fond of the Greek statue Eryx The God of Love in the Greek section of the museum, so when the God himself walks in the museum in his mortal guise as Eric Lord, I’d love to have seen the look on her face thinking the man of her dreams has come true! I loved this character and immediately identified with her for her awkwardness and loved that she was passionate for things others would deem her for being a geek. More people need to be like this instead of thinking they need to hide what they love doing from others!! There were some great lines/thoughts in this book that had me laughing out loud and rereading them after I’d stopped laughing just to start laughing again..
-Maia had seen a lot of flamboyant gay bars. This one was flaming hotter than a pink flamingo on fire. So I just got back from seeing the movie Beautiful Creatures, I apologize if this rant is a bit raw, but I just can’t help myself. 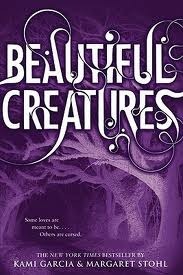 So I’m convinced that the Producer, Director, Screenwriter , NO ONE read or even knew what Beautiful Creatures was supposed to be about before they decided to make the movie… Kami Garcia and Margaret Stohl must have just jumped the gun at the first Director to offer to make the movie … I can’t even begin where it all went wrong. The only thing they got right was casting Jeremy Irons as Macon Ravenwood and Alice Englert as Lena Duchannes… Movie over. Get up and leave the theater before you have to endure it. I think they got too ahead of themselves, tried to rush you thru the movie with what’s going on in the book, only they left out A LOT OF KEY PARTS, not to mention A KEY CHARACTER or TWO or MORE!!!!…. It’s a Failboat.. To someone that hasn’t read the book, they would probably be completely lost. How Ethan finds Genevieve’s locket is all wrong, the scenes that he and Lena see from the past are too short, could have been a lot better. They made Amma into both Seer (which is what she is in the book) and Caster Librarian. The Librarian in the book is Marian Ashcroft, which was Ethan’s mothers best friend/work partner. Marian doesn’t exist in this movie..
Lena and Ethan never communicate with each other in their minds, like they do pretty much thru-out the whole book. Ridley never sucked on her red lollipop when she was “Dark Casting/Being Herself” – cracked me up how she did this in the book.. The winter dance never happened in the movie. While I read thru this chapter I was trying to imagine how’d they do it in the movie. Mitchell Wate (Ethan’s Father) never makes an appearance in the movie, so the scenes with him trying to unlock the door to his dads study, or how he discovers the covered up painting, going thru the Latin alphabet figuring out the clues his mother was trying to tell him about Lena “Claiming Herself” never happens..
Lena’s Birthday Party never happens.. The song 16 Moons never makes it into the movie- pretty important because the song would always change the closer she got to turning 16. You never find out that Macon is an Incubus and that he’s been eating at Ethans dreams , which is why he couldn’t remember the ends of them..
And in the movie, Lena makes Ethan forget that he even knows who she is. Her way of protecting him, until the very last few seconds of the movie when he sees something to trigger his memory of her. Sure in the book she becomes distant and they break up, but their breakup only lasts a few days. There are plenty of more things to point out, but I think you all can get the point. If you see it and like it , that’s great! But from my point of view it’s just a mess… LOL it’s all I can say, and that’s a shame. I was really excited to see the movie. Maybe on down the road someone else will have a better concept at how to go about rendering this from book to film. Wow! I have to admit I hadn’t heard of this series until I started seeing the previews for this movie a few months ago, but I knew from seeing them I definitely wanted to read these books. 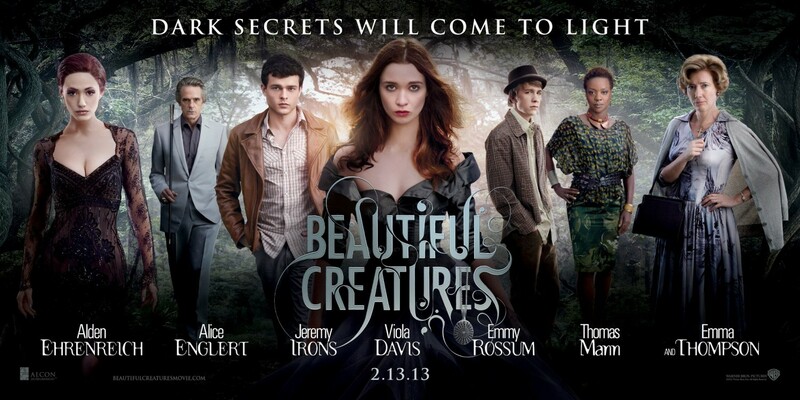 I really enjoyed “Beautiful Creatures”! It was a little slow to get going, but after you get all of the history of the town and some characters it picked up and took off! It’s a very sweet love story between an awkward young boy (who is mortal) and an equally awkward young girl (who is a caster). Ethan had been having strange nightmares for months about a girl he’s never met before who seems like she always needs saving but he can never save her in his dreams before he wakes up. Looks like his mystery girl won’t be a mystery for much longer since she just moved in to town….. So Lena moves in to stay with her town shut-in of an uncle. She’s not like the other debutantes/ southern belles because she has black hair instead of blonde, and she dresses in her own style, which doesn’t consist of any pastel colors. And since she’s totally different from all of the other girls in her class, she’s pretty much instantly hated. Which is still sad but true in high schools these days.. In the book Lena is 15, awaiting her 16th birthday where she will then be claimed either to be a Light or Dark caster. Something she is having a very hard time dealing with so her uncle is trying to help her thru it, and keep her safe since she runs into some obstacles along the way. Pretty neat meeting her other relatives and seeing what types of talents they possess to keep you wondering what Lena will end up being able to do once she’s claimed.